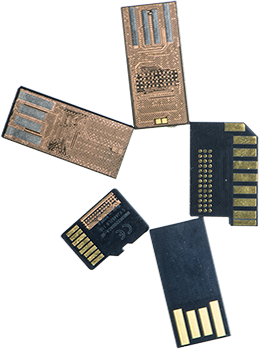 Monolithic flash drives are similar to traditional flash drives in structure, however, their components are encased in a ceramic case preventing easy access to the NAND flash memory chip storing its data. Monolithic flash drives are cheaper to assemble, more versatile due to their small form factor and some would say more durable because its ceramic case keeps all the components protected from some hazards like water. 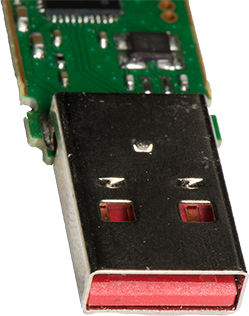 Recovering data from Monolithic flash drives is extremely difficult often requiring days or weeks of work making the price tag for recovery very high. We’re often asked, “how can I make sure my next flash drive isn’t monolithic”, the problem is manufacturers don’t advertise their products are monolithic. Some manufacturers have switched their entire product line over to monolithics while others arbitrarily use Monolithics throughout their product line. Generally, there are a few tells that a drive is monolithic. 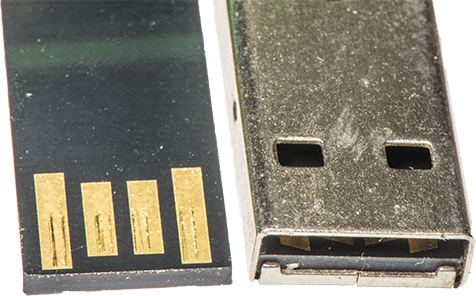 On a traditional flash drive (left), the plastic inside the USB connector will be solid, there is no lip holding a monolithic chip inside. 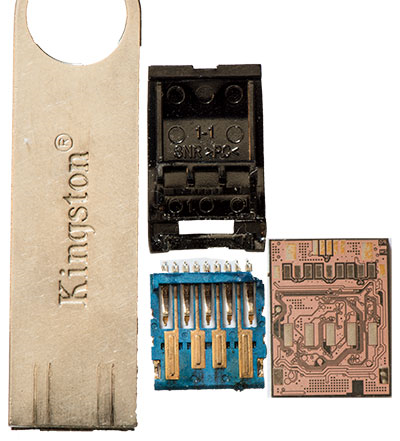 The USB connector is soldered to a circuit board along with all the other components. On a traditional flash drive (below) all the components are removable and serviceable. We can remove the memory chip and read it or swap out bad components. 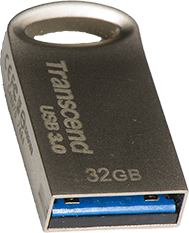 Both these Kingston DataTraveler and Transcend USB 3.0 drives are monolithic. You can tell by their slim and tiny design. If you look really carefully you’ll notice on the Transcend drive (below) there is a black plastic lip holding the monolithic chip in place. Most monolithic chips have some sort of metal or plastic encloser to support the chip. You can spot these over a standard USB connector because it will have a lip holding the monolithic chip in. Some manufacture inherently use only Monolithic products. All MicroSD cards are monolithic. SanDisk SD (Secure Digital) cards are monolithic. Most low-end USB 3.0 SanDisk & PNY Flash Drives are monolithic. Most Kingston flash drives are monolithic. Uniquely designed flash drives are typically monolithic. Recover My Flash Drive has been a pioneer in monolithic flash data recovery for over 11 years if you need your data recovered we can do it fast, securely and confidentially. We specialize in Monolithic media and have the tools and experience to do it right. Click here to send us a data recovery job.